One of science’s biggest strengths is its ability to change its mind when new evidence comes to light. Unfortunately, we as individuals don’t often live up to that ideal – even scientists aren’t perfect at changing their minds, and can be as bad as the rest of us once they leave the lab. This talk will explain Bayesianism as a theory of how one should change one’s mind in response to new evidence, and discuss its uses and limitations in real life. We’ll also explore the science behind why we’re so resistant to changing our minds, and some promising techniques that might help us “un-stick” our opinions when they’re stuck. 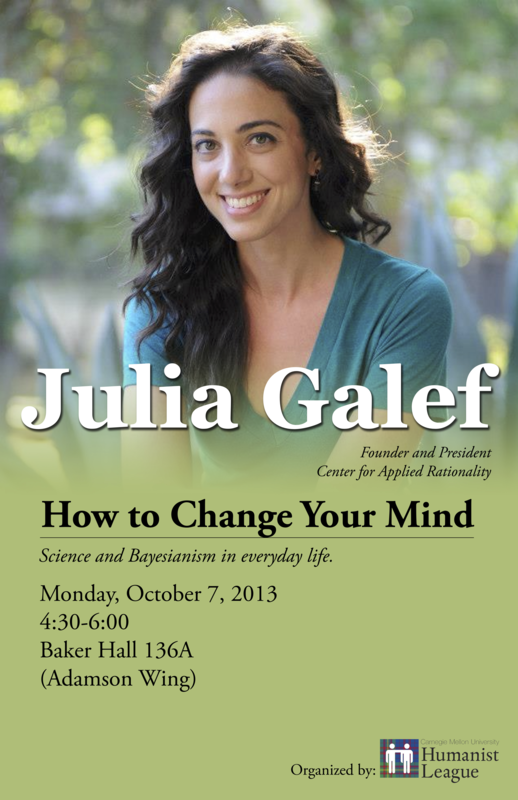 Julia Galef is the President and Founder of the Center for Applied Rationality (CFAR), a nonprofit think tank based in Berkeley, CA. CFR is devoted to developing, testing, and training people in reasoning and decision making strategies. It turns insights from decision theory, math, and cognitive science into simple mental habits that help with making more accurate predictions, avoiding rationalizations, following through on plans, and other such skills.